Each fall, the Asheville and Western NC area attracts visitors from around the U.S. to take in the colorful landscape this region offers. Given the 5,000 feet of elevation change within 50 miles of Asheville, the Blue Ridge Mountains offer one of the longest-running leaf color shows in the United States. Colors begin to change early October at the highest elevation areas in Western North Carolina and work their way down to the lower elevations by the end of October and into the first weeks of November. Both elevation and weather patterns have the biggest factor in Mother Nature's Color Show...an early frost speeds up the leaves turning colors and warmer fall weather allows the leaves to stay on the trees and in full color for an extended period of time. October 4-12: Highest elevations are located north of Asheville which offer 5,000 feet and higher - this is in the Grandfather Mountain and High Country area of Western North Carolina. October 10-19: Leaf colors increase in elevations above 4,000 feet in the Highlands, Cashiers and Lake Toxaway areas, southwest of Asheville. 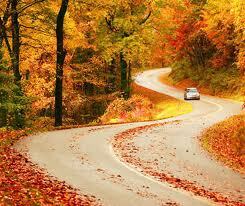 Here, not only can you see fall color but you'll see beautiful waterfalls as well. 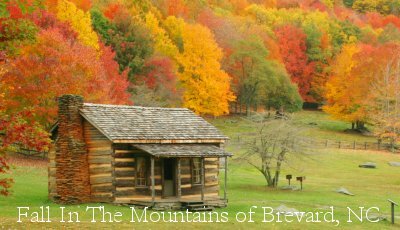 October 15-24: Mountains surrounding Asheville in the 3,000 and 4,000 foot elevation range in places like Waynesville and Sylva which are 30 minutes west of Asheville. Waynesville is home to a quaint downtown area, filled with one of a kind shopping and restaurants and throughout the year, local entertainment. Similarly, Black Mountain which is a quick 18 minutes east of Asheville offers a downtown of yesterday. Birthplace of Roberta Flack and home to Billy Graham's estate, Black Mountain is a quaint town, ideal for year round living. North of Asheville, by 30 minutes is the town of Burnsville which has been a dry county for years, therefore merchant shopping and dining isn't near as plentiful as areas such as Waynesville and Black Mountain. October 20-30: Asheville, which is situated at about 2,000 feet in elevation lights up with color about this time. If you have ever wanted to visit the Biltmore Estate, this is the 10 day period where leaves are usually at their peak. Retirement-popular town Hendersonville is also a place to mark as one to visit as it offers small town charm in a welcoming environment. Mohicans". Lake Lure is home to Chimney Rock State Park.